Tomatoes are the fruit of a vine plant that is often grown as a vegetable. Tomatoes cultivation has spread to all parts of the world and as a result, a huge number of varieties now exist. Beefsteak – this is a large round variety known for its heartiness, great for slicing for sandwiches and salads. Red, yellow, and orange varieties can be found. Plum – Romas and San Marzano are the most common of the plum tomatoes found in Hawaii. They are the medium sized oblong tomatoes, usually shades of red. These are firmer and fleshier, cooks like them for sauces and stews. Soups and casseroles too. Grape – These are a smaller variety of plum tomatoes. Also oblong shaped. Used whole in salads. Varieties are red and yellow. 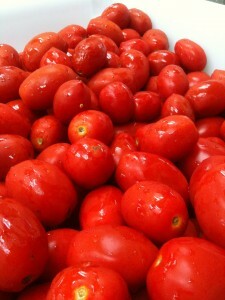 Cherry – These are the small round, sweet tomatoes found in salads. Varieties can be found red, orange, yellow and even purple. – Always wash your tomatoes will before preparing and eating. Also best to dry them off before tossing them in salad or when cooking, so that it will interact well with the oils. Take a knife (serrated steak knife works well), cut out the stem from the top of the tomato and cut an X on the bottom. Boil a large pot of water and fill a large bowl with water and ice. Let tomatoes sit in boiling water for 15-30, this is just to loosen the skin not to cook it. You can do this one by one if it is easier for you. Once you see the tomato skin start to tear or wrinkle, scoop out of boiling water and immerse in chilled bath for another 15-30 seconds. Then remove and let sit in another bowl. The tomato now should just slip right out if its skin. To seed, just squeeze the tomato over a strainer with a bowl beneath to catch the juice. Try to get as much seeds out as possible. The juice can be put back with the seeded and peeled tomatoes. 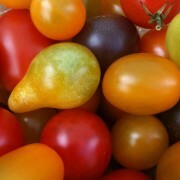 Select tomatoes that are heavy for their size, taut skin, no blemishes or soft spots. Store tomatoes stem side down and use in couple days for optimal flavor. Refrigerating tomatoes reduces flavor and encourages change in texture of flesh, giving tomatoes a mealiness instead of fresh juiciness. Peeled and seeded tomatoes can be canned or frozen for use later.